We’re sure it comes as no surprise that us gals at HappyHer are always on the lookout for inspiration that will spark the next adventure. The act of buying a plane ticket is not a challenge for us, truthfully I really don’t think we can go more than a few months without one of us heading off to check out a new travel destination or hopping over to one of our favourite North American cities for the weekend. We thrive on exploration and love sharing our go-to travel spots with all of you! As 2018 was coming to a close we knew we wanted to take off somewhere new, as we felt ringing in the new year in an unexplored city was the best way to set the vibes for 2019! We needed to switch things up from the usual house party extravaganza from the past few years and felt it was best to start the new year abroad! Travel tip: Flying anywhere on New Years is DOUBLE the price you’d pay just a few days later to go to the same destination. Airlines know people want to experience new destinations at that time of year. So either keep your eyes out super early for any deals you can find, or look to driving instead! (That is If you’re trying to keep the trip more economical). We decided that instead of jet setting down to Miami or to relax on the beaches in Mexico, we were going to drive on down to Detroit, Michigan. You say what?! That was the classic reaction from any of our friends when we told them where we planned on spending our new year. Yes, Detroit! Apparently it’s quite up and coming, the next Brooklyn we had read ;) And so we decided to pack our bags and head down to Detroit, so we could really understand what all this hype was about. And you know what? The Detroit advocates were right, it really is a fantastic city. The people of Detroit are down to earth and super helpful, not only with directions and key points about their city but they are super keen to give you advice on where to spend your time. There’s a ton of pride and hope oozing from the cities civilians. The restaurants are locally owned and are driven by individuals passionate about feeding their communities fresh, local and mouth watering dishes. Upon stepping into the cocktail bars, you feel like you’ve been transported to New York City for an evening. For all those music fans out there, you’ll be able to find plenty of live music that speaks to the Motown influence of Detroit’s prime. Finally, we suggest that you leave time to walk the downtown core and check out the influence of Detroit’s rich history, the architecture is fascinating! Driving to Detroit from Toronto or anywhere in southern Ontario (for all of our local readers) takes about 4 hours with little to no wait time at the border. It’s a straight drive west and a quick jaunt over to the U.S. side from Windsor, Ontario. Travel tip: If you’re looking to buy alcohol for your stay, stop in at the Duty Free shop on the Canadian side. It’s going to be a lot cheaper than what you can find in Canada and a lot more convenient than trying to find a shop once you reach Detroit’s downtown core. We stayed at the Hilton Double Tree downtown. For the time of year, we lucked out in price. We had a suite big enough for 5 girls and for the 3 nights it only cost $150 per person, breaking that down to $50 a night. Alternatively, you could stay in an AirBnB for a similar cost, entire apartments range from $50-$75 a night per person. Once you’ve gotten settled, it’s definitely time to eat! (Did we mention we love eating?) Detroit’s most popular restaurants proved to have quite the wait, at least for a group of 5. 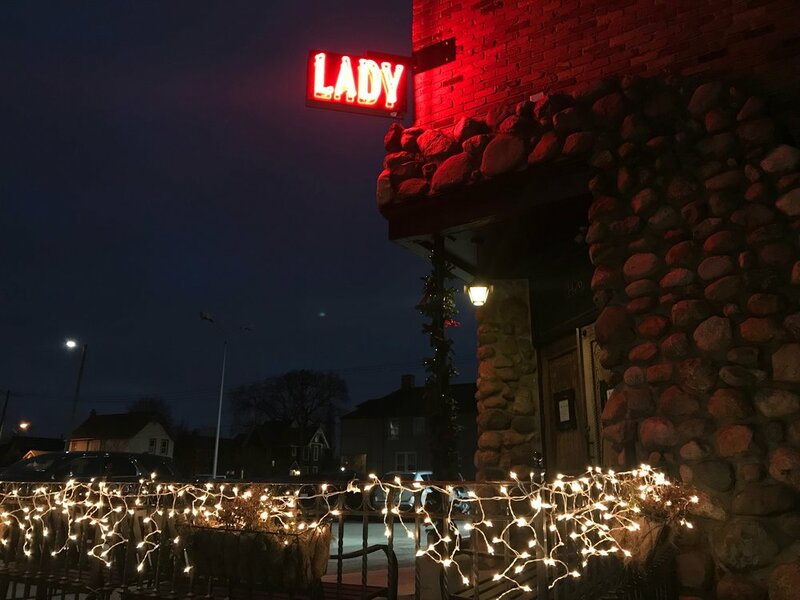 We were set on eating at Lady of the House on night #1 and so we headed on over to Corktown to put our name on a list for dinner around 7:30pm. We had about an hour to spare before they had a table ready for us and so the amazing host gave us a ton of funky drinks spots within a 10 minute walking distance in the surrounding Corktown area. Once we were done dinner we Ubered to what you’d traditionally call the downtown core. This area had quite a few options for great bars and was beautifully decorated for the holidays so it made our time there extra special! We enjoyed some live music and classic Detroit vibes at Cafe D’Mongos Speakeasy and then made our way over to Candy Bar for a late nightcap in a classy, disco inspired cocktail bar. Travel tip: Detroit has multiple neighbourhood pockets that offer a variety of food and drink options. We were told by locals to opt for a cab or Uber after it gets dark. We never felt in danger, but we were recommended to play it safe. After a relatively late night out, the best way to start any day is to hit up a local brunch spot. We ate at Rose’s Fine Food. A gem that’s located a little off the beaten path but no more than a 15 minute car ride from downtown. It’s a tiny spot, a hole in the wall brick building that lights up your soul as soon as you set foot. The staff are super friendly and the food is cooked fresh using the most wholesome ingredients. All of us felt that Rose’s was a total delight! Saturday afternoon we recommend walking downtown and doing a bit of a self guided architecture tour. Definitely make sure you go into the Guardian building and if you want that extra bit of history to take away from the trip, you can sign up for a free 1 hour guided tour! You don’t need more than a couple hours downtown, so we recommend driving out to the Heidelberg Project. This is a neighbourhood art project that was created by Tyree and Karen Guyton. The organization’s mission is to improve the lives of people and their neighbourhoods through art! While you’re in the area and if you like shopping, make sure to stop by Detroit Hustles Harder, a local clothing shop that offers up some funky Detroit branded wear. 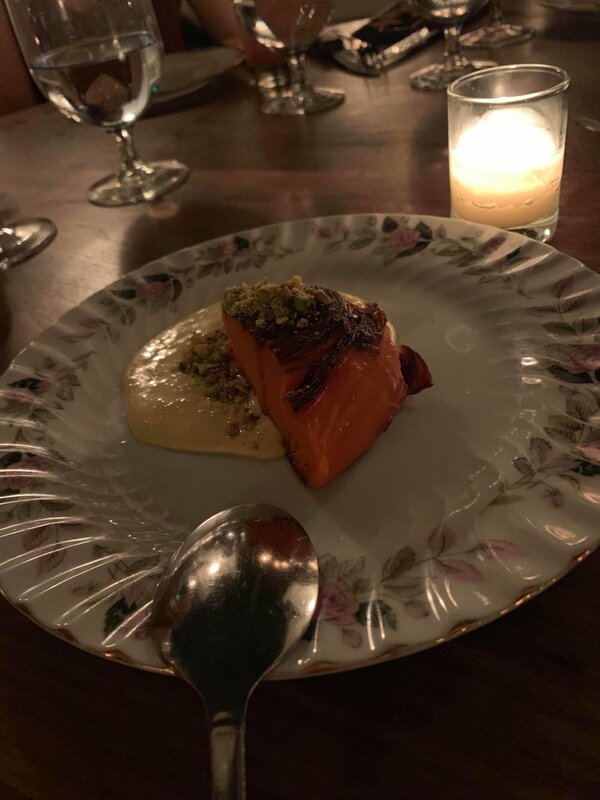 Our recommendations for Saturday night dinner would definitely be the Selden Standard. This mouth watering restaurant left us over JOYED with their unique dishes. They offered fantastic vegetarian options, meat based plates that our friends raved about, perfect sharing dishes for a larger group and had some pretty funky cocktails to go with dinner! After dinner head back downtown and make your way to The Belt. This is a colourful alleyway that is filled with fun bars offering lots of options to choose from depending on your late night mood. We decided to hit up Delux Fluxx, as it was recommended by a friend and had some pretty neat decor and captivating live music performances. We believe that Sundays are a day of beauty:) By our 3rd day in Detroit we had seen most of what we wanted to and felt a little more relaxed to go with the flow. Here are a few recommendations that we suggest to fit in during your last day in the Motor City if you have the time. Head to The Red Hook coffee shop for a relaxed vibe, delicious coffee and some sweet treats. :) If you’re interested in art, the Detroit Institute of Arts Museum is a stunning building filled with a variety of historical European, American, and modern day local artists. You won’t be disappointed by their collections.